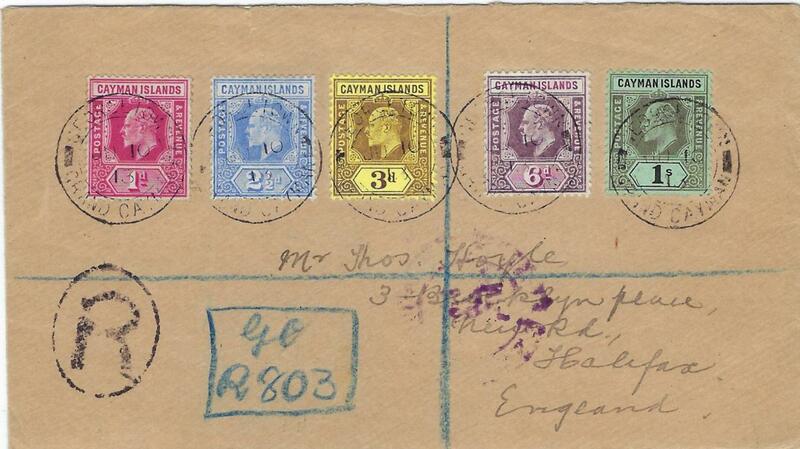 1904 (DE 3) registered cover to England franked by 1902-03 set of five plus extra �d. and 1d. 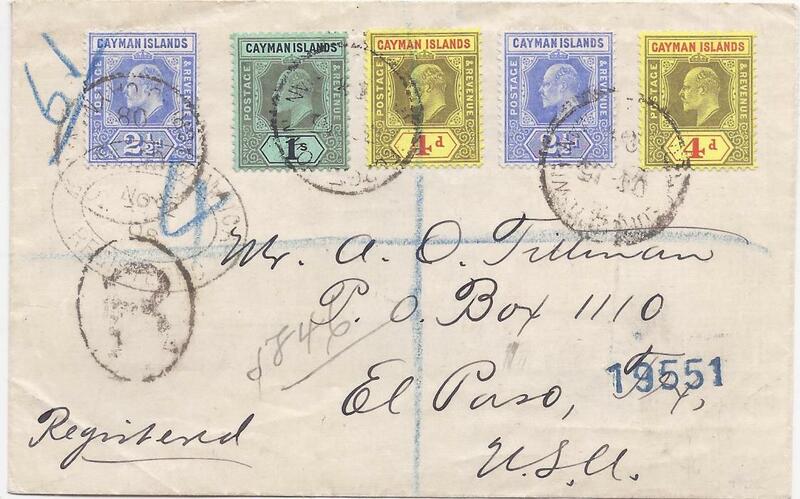 tied Grand Cayman cds, Jamaica transit at right and arrival backstamp; opened out envelope, a couple of slight tones. 1908 registered cover to USA bearing KEVII 2�d. (2), 4d. (2) and 1s. tied cds, manuscript registration and �R� handstamp, Kingston Jamaica Registration transit, reverse with New York transits and El Paso arrival cancels. 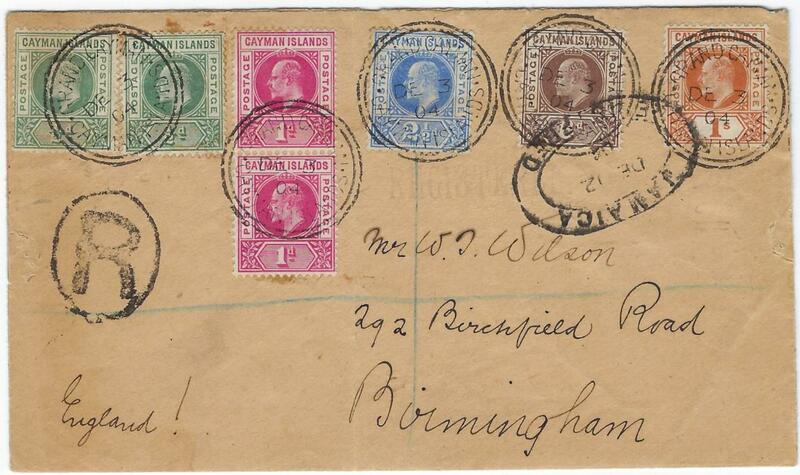 1913 (JU 10) registered cover to England franked by five values from 1907-09 series each cancelled Georgetown Grand Cayman cds, blue manuscript registration, reverse with Jamaica transit and violet U.S. Sea Post cds. 1913 1d. postal stationery envelope registered uprated to USA with �d. (2) and 1d. on front plus two horizontal strips of three of �d., one a plate marginal, tied Gerogetown cds. The envelope has been repaired at left under the �d. pair, a scarce correctly rated 4�d. stationery. 1915 registered cover to Pittsburg correctly franked at 4�d. rate with mixed reigns 1907-09 2�d. together with 1912-20 �d. pair and �d. pair and single, tied Cayman Brac cds. 1917 (OC 10) registered cover to Boston, franked corner plate marginal strip of three WAR STAMP 1�d. on 2�d. 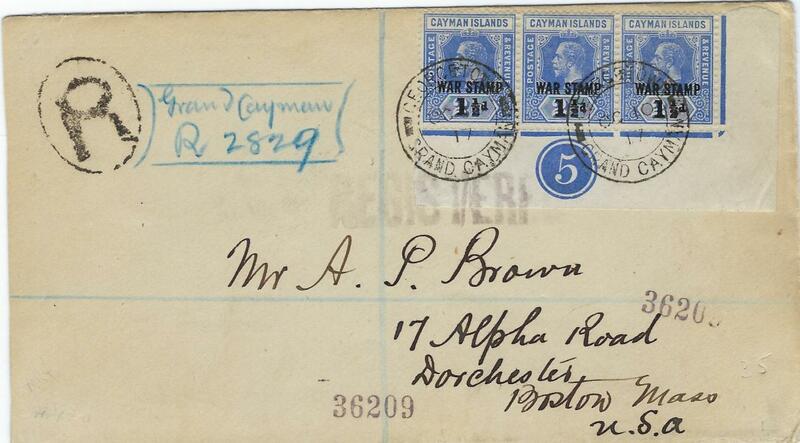 with Georgetown Grand Cayman cds, reverse with Jamaica and New York transits; fine and attractive. 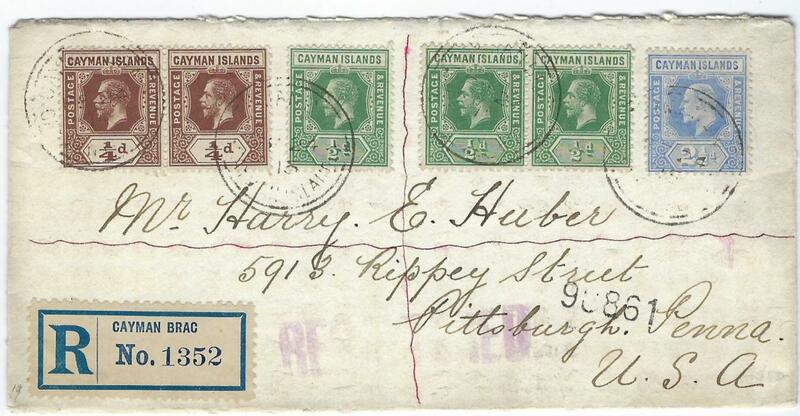 1922 (AU 12) registered cover to Pittsburg correctly franked at 4�d. rate with Wmk Mult Crown CA 3d. and Wmk Mult Script CA �d. 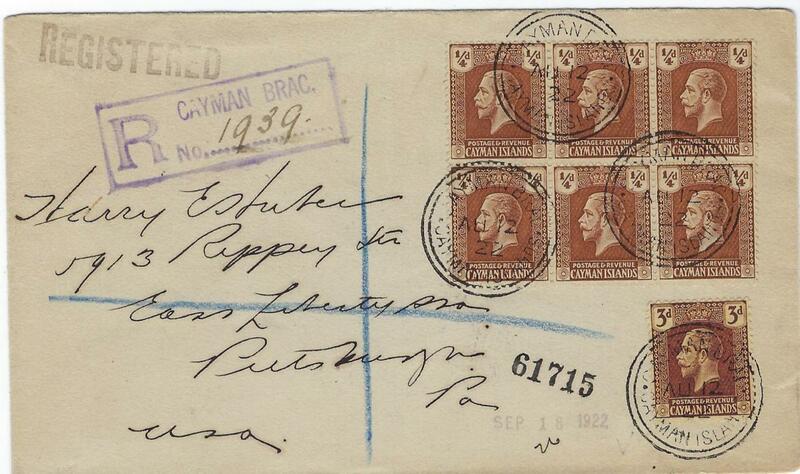 block of six tied Cayman Brac cds; fine condition.